ST. GEORGE — Carter Reynolds, Desert Hills High School’s senior standout hurdler, has signed a letter of intent to run track for the Weber State University Wildcats starting this fall. 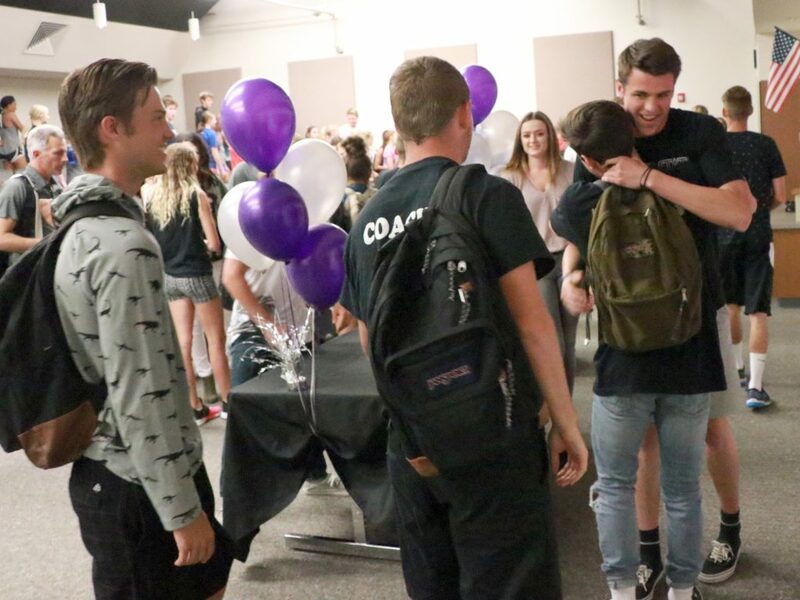 Reynolds signed the letter during a short ceremony after school Wednesday, in front of a group of about 100 people, including students, friends, family members, teachers and coaches. DHHS track coach Dace Goulding told the audience Reynolds embodies the attributes of competitiveness and loyalty. Goulding also cited Reynolds’ loyalty, saying he’s always been willing to run additional races as needed to help the team. Goulding said at a recent meet Reynolds stepped up and agreed to run a 4×400 relay leg on short notice. “I had an athlete that went down and I looked around and he was standing there. He had shoes on and I said I know you can bust out a big four for us,” Goulding recalled. “I’m super stoked about Carter going on to the next level,” the coach added, noting that Reynolds joins an illustrious group of about eight or nine Desert Hills hurdlers that have gone on to compete at the college level within the past decade or so. Reynolds said that while he did receive offers from other schools, he chose Weber State because it had a “good feel” after he visited the campus in Ogden and met with the coaching staff, including at least one assistant coach he’d worked with previously. Reynolds said Weber’s head coach is new this year and eager to build the program. “He just came with a lot of energy and he told me that he wants to build a great crew there and he said I was one of his top prospects. I was really excited about that, and the (scholarship) offer he gave me was extremely … it was way more than I thought I would ever get as a hurdler,” Reynolds said. “I had other schools contact me, but I really kind of was narrowed in on Weber and I just love the feel of it,” added Reynolds, who said he plans to major in radiation therapy at WSU. Reynolds placed first in state in both the 110-meter hurdles and the 300-meter hurdles as a junior last year, posting a winning time of 14.75 seconds in the 110 and 38.78 seconds in the 300. The Thunder also won the state 3A title as a team. Last weekend, at the Arcadia Invitational in California, Reynolds established a new personal best time of 38.67 seconds in the 300-meter hurdles, placing third overall at the regional meet featuring some of the top athletes in the country. 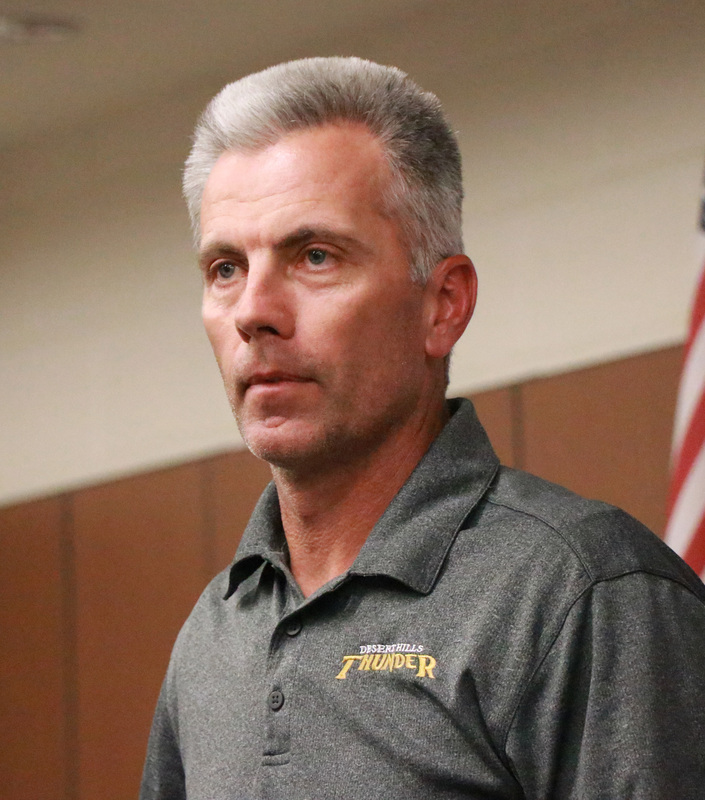 Reynolds’ storied career at Desert Hills High includes helping the Thunder football team to a state 3AA championship in 2016. A speedy 6-foot-4, 185-pound defensive end, he led Region 9 with 16.5 sacks last fall. 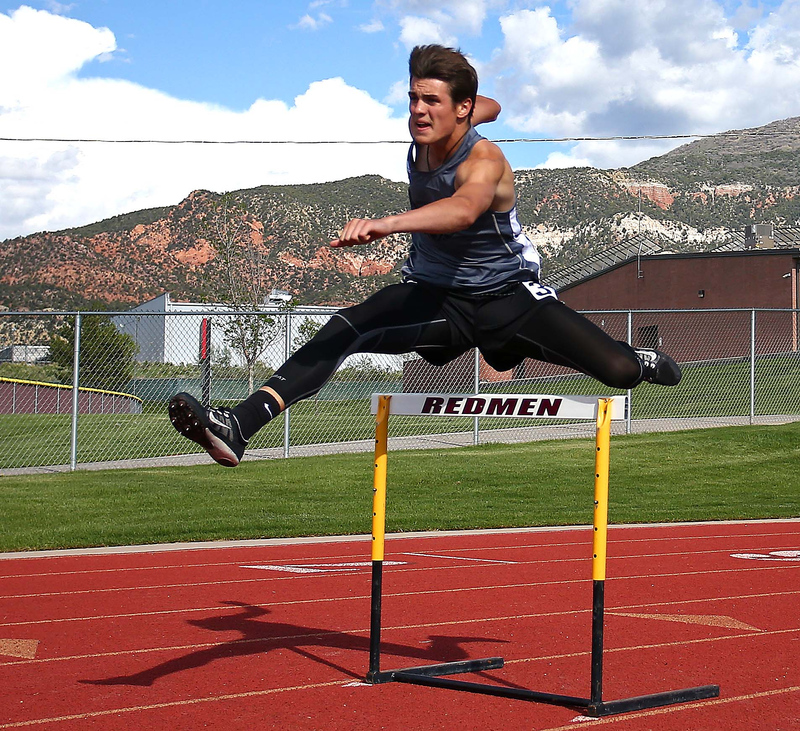 This weekend, track fans can see Reynolds and his teammates in action, along with dozens of other athletes from approximately 20 other schools from around the region and state, at the 10th annual Desert Hills Invitational state qualifying track meet. The two-day meet is scheduled to take place at DHHS Friday from 3 to 8 p.m. and Saturday from 9 a.m. until early afternoon. WAY TO GO CARTER! What a great example and representative for our community! Congratulations Carter you’ll Love WSU and running track there. Also good Luck in the upcoming BYU Invitational HS. Looking forward to a repeat win in the 110 M Hurdles. Thank You for writing this article Jeff Richards it’s not often you see Track and Field reported in the media. Article brought back memories of when I was the 110 HH winner in 1969 BYU Invitational a great Meet.